This raccoon stood by his friend until the very end. 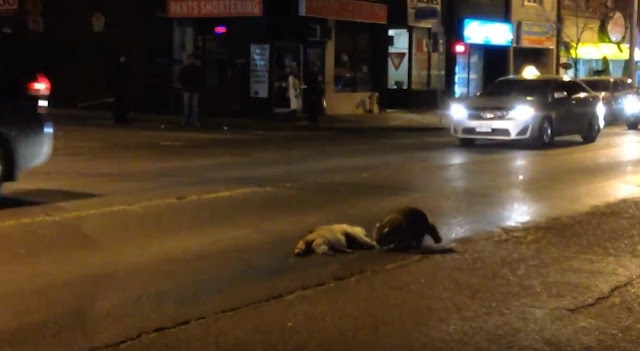 Their tragic story unfolded on a busy street in Toronto, Canada, according to a video uploaded on YouTube by user A Ka. On January 30, both of the raccoons were crossing the street, when one of the two got run over by a car, the video's description explains. What happens next is absolutely devastating. "Cars were honking impatiently, people were yelling at the raccoon to get off the road, afraid for its life. It just couldn't leave its friend," the YouTube poster wrote. The raccoon was also seen running around in circles, crying out. The raccoon was eventually honked at and shooed off the street onto a sidewalk, where he scurried off into the night. This painful scenario provides further proof that animals are just as capable as humans at feeling and displaying powerful, complicated emotions like sorrow and loss. From an article by Dr. Marc Bekoff in Psychology Today: "There is no doubt that many animals experience rich and deep emotions... Grieving and mourning clearly show that nonhuman animals are socially aware of what is happening in their worlds and that they feel deep emotions when family and friends die." Responses to "Crying Raccoon Doesn’t Understand Why His Friend Won’t Wake Up "
I couldn't watch the video, just the description was enough. Of course animals have the same emotional states as humans. We are animals as well. There is no real difference. My heart went out to this poor creature. God has given us all feelings!! animals show more "humanity" than many people.